/*0205455336 Emmer, Classroom Management for Elementary Teachers 7e*/Classroom Management for Elementary Teachers, Seventh Edition, gives teachers the information and skills they need to establish management systems in today's rich, multicultural classroom, based on the authors' 30 years of research and experience in more than 500 classrooms. This best-selling text helps teachers plan, implement and develop the most basic classroom management tasks to develop a smoothly running classroom that encourages learning. Written for the prospective or new elementary school teacher, the text's content is ready to be applied in a classroom setting. The text addresses the planning decisions teachers must make, including arranging the physical space, creating a positive climate, establishing expectations, rules and procedures, planning and conducting instruction, encouraging appropriate behavior, addressing problem behavior, and using good communication skills, with particular attention paid to the growth of diverse and inclusive classrooms. All examples, checklists, case studies, and group activities are designed for the elementary level. 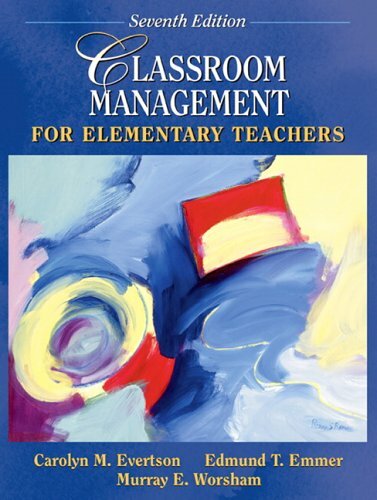 Classroom Management for Elementary Teachers, Seventh Edition, gives teachers the information and skills they need to establish management systems in today's rich, multicultural classroom, based on the authors' 30 years of research and experience in more than 500 classrooms. This best-selling text helps teachers plan, implement and develop the most basic classroom management tasks to develop a smoothly running classroom that encourages learning. Written for the prospective or new elementary-level teacher, the text's content is ready to be applied in a classroom setting. The authors address the planning decisions teachers must make, including arranging the physical space, creating a positive climate, establishing expectations, rules and procedures, planning and conducting instruction, encouraging appropriate behavior, addressing problem behavior, and using good communication skills, with particular attention paid to the growth of diverse and inclusive classrooms. All examples, checklists, case studies, and group activities are designed for the elementary level.